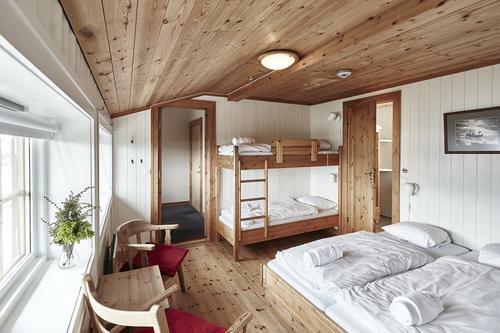 Haukeliseter offers rooms in a variety of different categories. Choose between modern and comfortable or simple rooms for those on a budget. Below you will find information about the different types of rooms mentioned in our price list, what they look like and how they are equipped, as well as what you might need to bring to visit the mountains. The mountain rooms have en-suite bathrooms and made beds. None of the rooms have a television, but we have a tv-room. 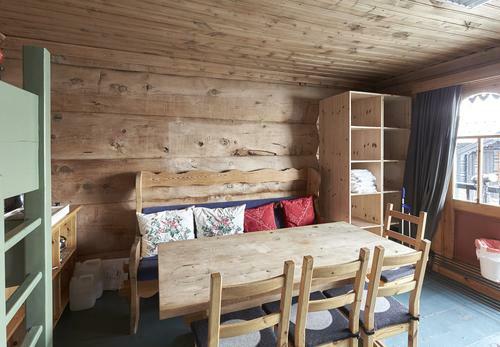 Haukeliseter have single rooms, double rooms and larger family rooms with three or four beds. If you stay in one of these rooms, breakfast is always included. The room called "Nansen Sør" is Haukeliseter's largest suite. It's situated on the second floor of the oldest building at Haukeliseter and has an amazing view over the lake and the mountains. Haukeliseter’s self catered rooms have two, three, four or five beds. All of the rooms have a mini kitchen containing a small cooker, fridge, pots and pans, plates and cutlery. These rooms are perfect for guests who would like to cook for themselves and thereby have a more reasonably priced holiday. Of course it is also possible to buy breakfast, lunch pack and/or dinner in Haukeliseter’s restaurant. Showers and toilets are situated in the corridor and you bring your own sheets. Of course it is possible to hire sheets from us here, if you don't prefer to pack your own. 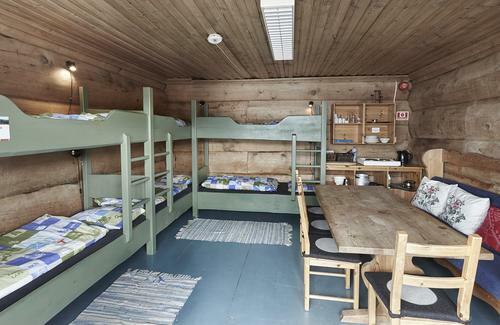 “Kuskeloftet” and “Stabburet” are the type of accommodation which resemble many of DNT’s un-staffed and self catered trekking cabins. In these rooms you basically pay for a bed rather than the whole room and this option suits guests who are keen on making their stay as cheap as possible. If you wish to have the whole room to yourself, you can of course hire the whole room for an additional fee. Many guests also prefer to stay in these older buildings rather than in the more luxurious mountain rooms, simply because of a nostalgic preference for the history of the buildings. It is without doubt charming with the very old creaking wooden floors and walls which ooze 19th century history. The rooms have two, four or six beds. You will find cookers, pots and pans either in the rooms or close by. Water, showers and toilets are situated in the neighbouring building (showers cost 10 NOK for 4 minutes of hot water). As with the self catered rooms described above, you bring your own sheets (or hire them here), and you clean your room before departure – as is common practice on most DNT accommodation.The “Kuskeloft” rooms are situated in the old “Kuskeloft” building. The name derives from the time when Haukeliseter was a resting place for both horses, travelling from east to west, and the coach men. Haukeliseter was a good place for them to stop and have a rest and “Kuskeloftet” was were the coach men slept.The “Stabbur” rooms are Haukeliseter’s most basic rooms. They have the same standard and are equipped in the same fashion as the “Kuskeloft” rooms apart from not being recently renovated. "Stabbur" is the Norwegian word for 'food storage'. 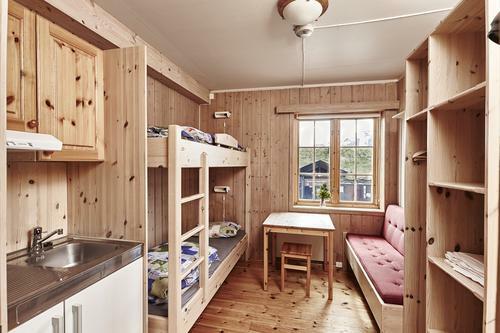 The dormitory has 24 beds, and the price is the same as for the “Stabbur” rooms. There is a toilet inside the room. The showers are the same as for the Stabbur rooms. They cost 10 NOK for four minutes of hot water.